The 43rd annual edition is now available! 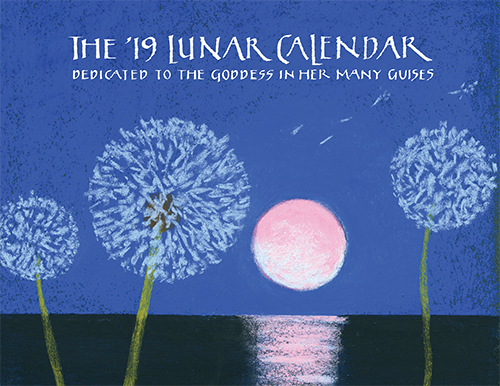 This easily read, yet informative and scholarly calendar is perfect for both the beginner and the seasoned moon-lover. The '19 edition features fresh work from 24 artists, poets, and writers, full astronomical and astrological data, the lunar year-at-a-glance, complete instructions, and an excellent bibliography. 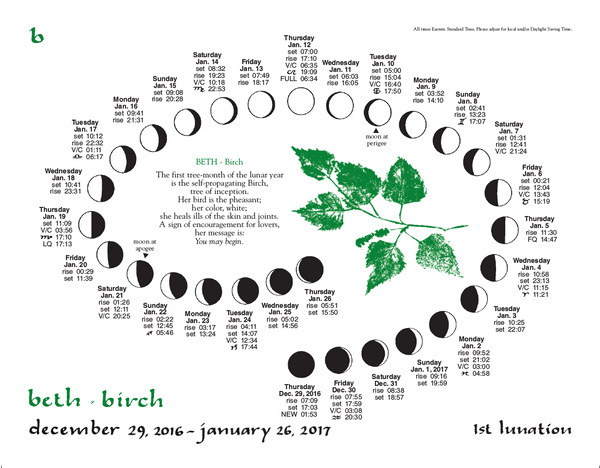 THE LUNAR CALENDAR teaches the tree-alphabet as inspired by THE WHITE GODDESS by Robert Graves. Each of the 13 lunations (lunar months) is depicted in a unique spiral format, showing all the moon's phases, rise and set times, apogee and perigee, the transits of the zodiac, void-of-course times, earth festivals, and visibility of the morning and evening stars.